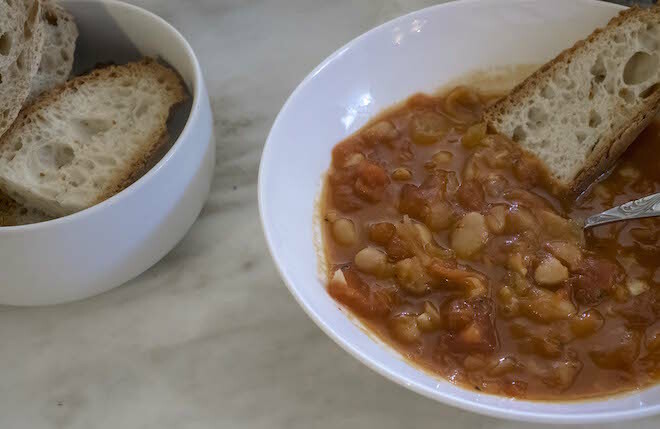 This Tomato Cannellini Bean Soup is a super simple (and filling) lunch or dinner option that you can whip up in just under an hour – from preparation to table. Having a few cans of cannellini beans and crushed tomatoes on hand in the pantry, means you can always have this recipe at the ready for quick meals. This hearty soup is best enjoyed with warm buttered bread and a good sprinkling of fresh herbs. Taste the soup and add any additional spices or flavouring according to taste (salt, pepper, chilli flakes, cumin powder, garlic powder, etc). Also pay note to the consistency of your soup, as well as flavour – adding a little extra water or stock if needed. If so, then allow to simmer a little longer. Tip: Before throwing out the crushed tomato can, use it as a vessel to fill the water or stock for the soup so that you can use up all of the excess tomato that’s stuck to the inside of the tin so it doesn’t go to waste (it all helps with the flavour).